Silk Ribbon Embroidery. How to thread a needle. 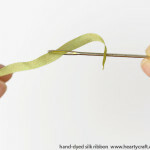 Today I wanted to share one simple but very handy hint about stitching with silk ribbon, that is how to thread a needle. 1. Thread the ribbon through the needle’s eye. 2. Then pierce the end of the ribbon with the needle. 3. Pull the long end of the ribbon down. 4. Tighten it until it securely locked in the needle’s eye. I love this technique as it also helps to save some ribbon. 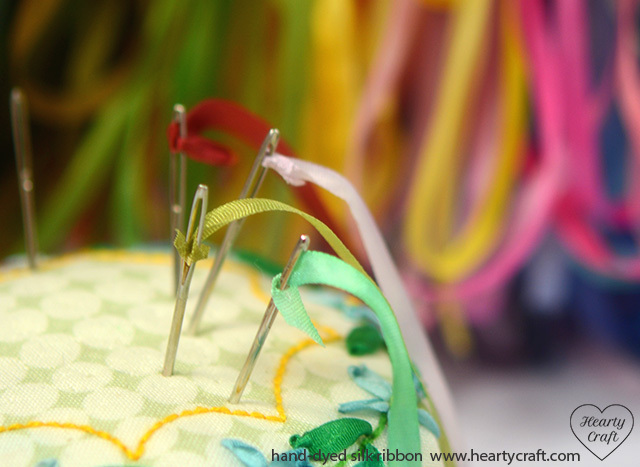 Since the the ribbon is securely held in place, it is not getting damaged by constant rubbing against needle eye whilst you are stitching, so you can use a length of the ribbon entirely up to its end. If you threaded the ribbon in a regular way, as you would normally do with embroidery floss for example, it wears out very quickly and you end up throwing away a considerable piece. 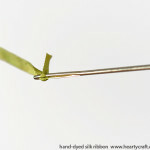 And of course, locking the ribbon into the needle eye saves not only the ribbon, but your time and nerves as well. Keep calm and stitch on! That’s all for today, and if you’ve run out of ribbons, don’t forget to visit our shop. Good news for those who wanted to get smaller lengths, we’ve got silk ribbons in 3 meter skeins as well for almost every colour now! This entry was posted in Blog Posts and tagged How to, Silk ribbon embroidery on 25th July 2014 by Zinaida. Thank you for the instructive pictures and descriptions. 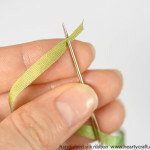 I teach ribbon embroidery and recommend your website to my students. Again THANK YOU!! !